Bundesliga | Europe calling for Dortmund and Leipzig - the Matchday 32 round-up! Europe calling for Dortmund and Leipzig - the Matchday 32 round-up! It was third versus fourth at the SIGNAL IDUNA PARK as the battle for third place – and the final automatic spot in the UEFA Champions League group stage – came to a head on Saturday afternoon as Dortmund hosted Hoffenheim. 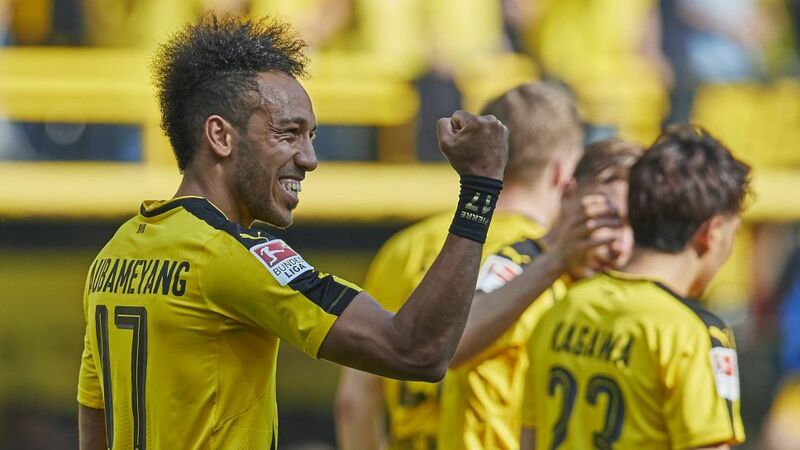 Marco Reus got the hosts off to the perfect start in the fourth minute, while Pierre-Emerick Aubameyang could even afford to miss a penalty before notching his 28th of the campaign late on, putting him joint-top of the scoring chart with Robert Lewandowski. Andrej Kramaric's late strike was a mere consolation as the hosts' two-year unbeaten run at home continued. A dominant performance in the capital sealed Leipzig’s place in the group stages of next season’s UEFA Champions League, capping an astonishing debut campaign in the Bundesliga. It was the kind of typically vibrant, attacking display that has become the trademark of Ralph Hasenhüttl’s side, with a pair of goals apiece from Timo Werner and Davie Selke. The former remains the top-scoring German in the Bundesliga this term after taking his tally to 19. Darmstadt were relegated to Bundesliga 2 after this defeat, but, characteristically, not without a fight. The Lilies came into this one having won the previous three to keep their faint hopes of survival alive and were hoping to take advantage of any slip-ups from a Bayern side already crowned champions. The Bavarians were typically ruthless early on and went ahead through Juan Bernat, but Torsten Frings’ side fought back gamely - only for former Bayern player Hamit Altintop to have a late spot-kick saved by Bayern’s third-choice keeper Tom Starke. It had to happen at some point, but Werder Bremen’s remarkable 11-game unbeaten run came to an end in an enthralling encounter on Friday night at Cologne’s RheinEnergieSTADION. The visitors came back from two goals down in a madcap first half, only to go two goals down again, and Serge Gnabry’s late strike was not enough to salvage a point. For the hosts, Anthony Modeste found the net twice and so, for the first time in history, the Bundesliga has three players on at least 25 goals after Matchday 32. The three points lift the Billy-Goats above Alexander Nouri’s side and into the UEFA Europa League spots. The spotlight for Europa League qualification was on Cologne and Bremen on Friday night, but Freiburg once again quietly went about their work against Schalke and are now up to fifth - an automatic qualification berth. A symbol of the way the Black Forest outfit have gone about their work this season is Florian Niederlechner, whose brace against the Royal Blues secured the three points in southwest Germany and moved his total for the season onto eleven. Never before have two promoted teams finished in the top five at the end of a Bundesliga campaign - can Freiburg finish off their impressive season and rewrite the record books? What if Alfred Finnbogason had been fit all season? The Iceland international followed up a goal in the 4-0 hammering of Hamburg last week with a fine second-half strike against an off-colour Gladbach at the BORUSSIA-PARK. With seconds left, Augsburg could smell Bundesliga safety, but then the hosts struck: cruelly, it was a former Fuggerstädter player, Andre Hahn, who scored the late leveller and means that Manuel Baum’s side will likely have to take something from games with Borussia Dortmund and Hoffenheim before the season is out. Ingolstadt were left wondering what might have been after going 1-0 up in the closing stages at home to Leverkusen, only to be denied by 17-year-old Werkself midfielder Kai Havertz moments later. Victory would have lifted Maik Walpurgis' hosts to within a point of the relegation play-off spot but they must now win both their remaining games to stand a chance of survival. For Leverkusen, meanwhile, who started without Javier 'Chicharito' Hernandez once again, the draw just about guarantees their top-flight status after a disappointing end to the campaign. Speaking of relegation, the Wolves did their chances of staying up the world of good with an impressive victory in Frankfurt. Daniel Didavi crowned his 100th Bundesliga appearance with the opening goal shortly after the break, before Mario Gomez netted his 15th of the season to seal the victory. The Germany striker has now found the target nine times in ten games under new coach Andries Jonker. If they win again at home to Gladbach next week, Wolfsburg will finally be able to breathe a sigh of relief. The ultimate relegation six-pointer, and a game that neither side could therefore afford to lose. Both clubs were tied on 33 points going into the game, with Mainz only lying ahead of their hosts and therefore occupying the final safe position in the table because of their superior goal difference. The pressure of the occasion showed as it was a nervy affair at the Volksparkstadion with few clear-cut chances for either side. On the balance of play, HSV will be the happier of the two sides to come away with a point, but it does little to help their relegation troubles except keeping them breathing heavily down the necks of the Mainz players with two nail-biting games remaining.